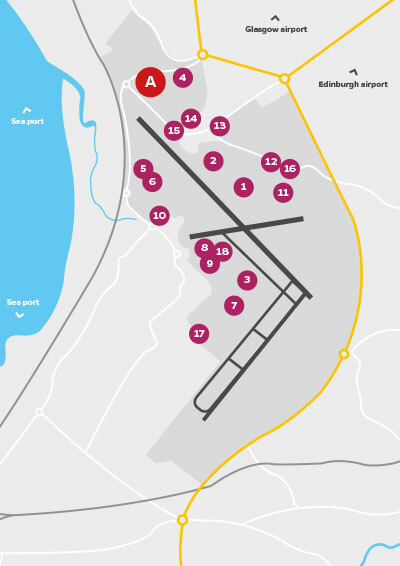 Prestwick International Aerospace Park is a 34 acre site adjacent to Glasgow Prestwick Airport and benefits from Enterprise Area incentives. It offers fully serviced development plots for bespoke commercial development, with plots ranging in size from approximately 2.8 acres to 7.09 acres. For more information on development plots click here. To find out more about the plots available contact us. With the wide range of government support for aerospace related businesses the Enterprise Area is the perfect place to start, expand or re-locate your business. Business Rates Discounts of up to 100%. A streamlined approach to planning. International promotion and marketing of the Enterprise Area by Scottish Development International and advice to help businesses grow in global markets. Skills and training support to fully capitalise on the employment opportunities created. To find out more about the incentives available on the Enterprise Area click here. For a map of the Enterprise Area zones at Prestwick Aerospace click here.